Symphony Hall was, I estimate, about 80% full (a pretty good turnout, I am told) for this all-English concert, broadcast live on BBC Radio 3. The programme’s only concession to wider popularity was the Tallis Fantasia, which must rank high in the RVW statistics alongside such Classic FM “pops” as The Lark Ascending. John Wilson is something of a star, a no-holds-barred communicator, an advocate of the music of film and music theatre but also an adept at British music of the last century. He is much in demand, and I do hope that he will record more British music. He has performed many of the RVW symphonies in concert here and there. In recent years, he also did the other two leading Bax tone poems: Tintagel by the BBC Phil in Salford Quays and Fand on 5 May 2016, again with the CBSO. I hope that he might be tempted to add Bax symphonies 2, 5 and 6 to his repertoire—he has a gift for music of such wild beauty and unchained imagination. The Symphony Hall audience greeted Wilson with evident affection. His Tallis Fantasia went well with obvious attentive care to the score’s intricacy and dynamic tiering. That said, several prolifically stentorian coughers seemed to save their best bronchial efforts for the most hushed spiritual moments. Thanks be that the gradient into silence in the closing bars was not trodden flat by such aural graffiti. The stormy November Woods followed, Bax’s metaphor for the buffeting gales of his love life as much as for ecstatic repose. The work boasts one of Bax’s most magically cradled and long-breathed melodies. It was diaphanously presented, with particular attention paid to the two harps. As with the Tallis Fantasia, I noticed Wilson’s tendency at key climactic moments to drive the tempo forward. This is done with noticeable but almost microscopic accelerations of phrasing; it works. After the interval came the second Vaughan Williams piece. It is something of a rarity, although I had heard Five Tudor Portraits once before when it was conducted by Vernon Handley in Liverpool in November 2000. During the afternoon rehearsals, Wilson and the well-drilled CBSO, choir and soloists had been labouring over this work with its many tricky corners. Their application and that of chorus director, Simon Halsey (who came out at the end to acknowledge the applause) reaped rewards in the evening. The Portraits comprise five episodes/movements of varying duration, from two miniature gems (Pretty Bess and the concluding Rutterkin) to three more substantial movements. The Tunning of Elinor Rumming set the scene: the sound equivalent of Bruegel meets Hogarth. The resolute yet lilting Neal Davies was heard in the irresistibly romantic cavatina: Pretty Bess. The style here is related to moments of melting song in Sir John in Love, especially the Fenton/Page duet. The CBSO’s boosy-sounding bassoon matched the choir and Ms Kelly sway for sway in the first Portrait. This writing perhaps inspired Malcolm Arnold in years to come in the whoosy-inebriated stretches of his concert overtures. The Dies Irae also stalks the score pretty frankly. Unruly bird-song evocations are in lavish play in the Philip Sparrow Romanza. This had me wondering whether the musically literate Stephen Sondheim and Paul Gemigniani had this passage in mind in Greenfinch and Linnet Bird in Sweeney Todd. In the Burlesca (Epitaph on John Jayberd of Diss) there is an uncannily accurate pre-echo of the rapid-fire spatter of Orff’s Carmina Burana, which in 1932 lay two years in the future. 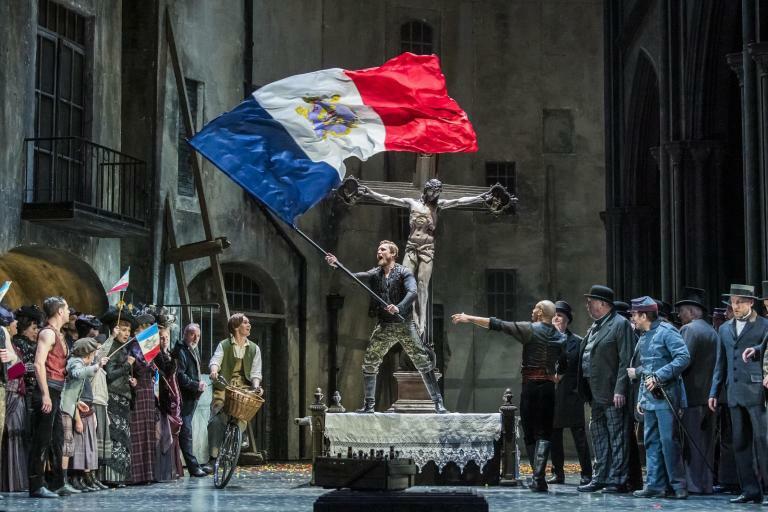 Although the uproariously uplifting Rutterkin finale brought the house down, the most memorable part was the long and intensely moving quasi-symphonic march that is the Romanza – Jane Scroop (her lament for Philip Sparrow). All credit to everyone, especially Rachel Kelly, for moving at least one of the hall’s listeners to misty eyes. Vaughan Williams was a past-master at inventive word-setting, and relished a challenge. The words for the Portraits were printed in the excellent although pricey (£4) programme book. They mix Tudor English and Latin. The more abstruse terminology was shown with definitions in grey-background panels, as were translations of the Latin. In a way, it was a trap to try to follow the words when so much was happening on the concert stage. Skelton’s torrential flow of words spills forth often at tongue-twisting speed and is entwined with instrumental detail. The evening began with the usual pre-concert talk, given with disarming candour by Stephen Johnson. Here the emphasis was on the revolutionary nature of the Tallis Fantasia—a point worth emphasising given the work’s most-loved status acquired since the RVW centenary in 1972. Before sallying forth about the Tudor Portraits, Johnson played us an extract from the Fourth Symphony and recommended the composer’s own incandescent recording. The grind, grit and fury of that symphony was illustrated by the very start of the work, although the recorded illustration stopped just short of the magical singing melody that parallels a similar moment in the Sixth Symphony. In any event, the Fourth is indeed a different work than the Tudor Portraits. The Portraits brings us a series of character pictures, bibulous, raucous, amorous, dissolute and riotous. In these the poet John Skelton ran a whoopingly secular range. Vaughan Williams was able to write with equal mastery and sympathy when inspired by the two Tudors who arched over this programme: Tallis (devotional – spiritual) and Skelton (worldly – temporal). In a nice linkage gentle chordal progressions directly echo the Tallis Fantasia in the setting of the words “Farewell for evermore” at the end of the Jane Scroop Romanza (Portrait No. 4). Johnson used recorded illustrations throughout and they sounded extremely good in the Symphony Hall acoustic.